Product #21384 | SKU 4370 | 0.0 (no ratings yet) Thanks for your rating! 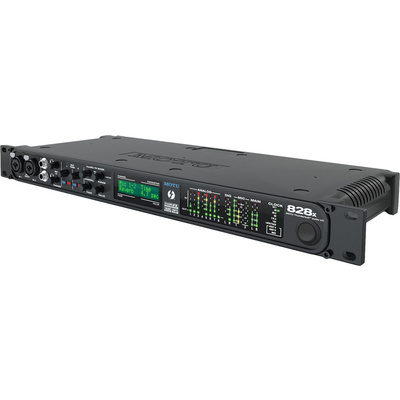 The MOTU 828x Professional 28x30 Audio Interface with Thunderbolt Technology is a 1RU 19" rack mountable digital audio interface that can connect to your 32- or 64-bit Mac or PC computer over Thunderbolt 1, Thunderbolt 2, or USB 2.0 (compatible with USB 3.0 ports). Up to six Thunderbolt devices such as displays and hard drives can be daisy chained together with the audio interface at the end of the chain. The interface offers eight channels of 192 kHz analog recording and playback, combined with 16 channels of ADAT optical digital I/O (8 channels at 96 kHz), stereo S/PDIF, MIDI I/O, word clock, two headphone jacks, and stereo XLR main outs. Equally suited for the studio and stage, the interface can also function without a computer connection as a standalone mixer with effects such as reverb, EQ, and classic compression. Two front panel microphone/guitar inputs feature high-quality preamps, plus a V-Limit hardware limiter for overload protection. Additional protection is available via MOTU's Soft Clip function. Each microphone input is equipped with individually switchable 48V phantom power and a 20 dB pad. Each microphone input also has a rear panel send that allows for inserting outboard gear before the analog to digital conversion. An additional 8 balanced analog inputs enable connection to most studio gear, including microphones, guitars, synthesizers, keyboards, drum machines, and effects processors. In turn, these can all be recorded, monitored, routed and processed using the professional on-board CueMix FX digital mixer, with minimal latency and processor strain on the computer. Additionally, the interface includes a built-in chromatic tuner and audio analysis tools such as a Fast Fourier Transform function, spectrogram, and X-Y phase alignment plot. The mixer can be remotely controlled using an iPad and TouchOSC software (sold separately). The interface includes a license for AudioDesk 3 digital workstation software for Mac OS X.